Some people love Nextel push-to-talk phones. They are the closed thing to walkie-talkies that you can get without have to carry around a complete separate walkie-talkie device. And who wants to carry around a phone and a walkie-talkie at the same time? Nextel phones seem to be very popular in work environments when messages need to quickly be sent and received. A few of my friends introduced me to an app called HeyTell, which allows your iPhone to function quite similar to a Nextel phone. I gave it a try! HeyTell allows you send and receive voice messages (much like a walkie-talkie) across iOS, Android, and Windows phones. Since I had never used a Nextel phone or used a walkie-talkie since I was younger, HeyTell was quite a different experience for me. 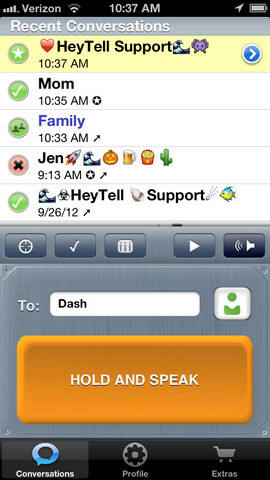 The app is simple to use as you fill in your contact’s name and simply hold down the big orange HOLD AND SPEAK button to record your message. As soon as you release the button, your message will be sent. The contacts button is separated into 4 categories: your HeyTell friends, your iPhone contacts, your Twitter followers (if applicable), and your Facebook friends (if applicable). All recent conversations (tracked by contact name) are tracked at the top of the the message recording page. You just need to click on the conversation to go to the back-and-forth messages between you and that contact. 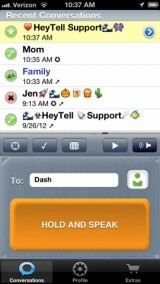 You can replay any voice message and even toggle speakerphone mode with two simple buttons on the main page. You can also delete any recent conversation or individual message by the typical swipe left gesture. Furthermore, HeyTell provides the ability to share your current location and instantly add incoming contacts as friends with two simple buttons on the main screen. I was impressed by HeyTell’s privacy feature. There is a low, medium, and high privacy level (as seen in the screenshot) that involve different permission variations of your Facebook friends, Twitter followers, and personal iPhone contacts. It is a smart feature to add (let’s say) to a child’s phone, so that a parent can make sure that only voice messages from approved contacts are sent to their phone. It is important to note that users also have the ability to block contacts as well. I was quite impressed by the concept of HeyTell, as you can basically use your data plan to talk to family & friends instead of precious voice plan minutes. Hypothetically, you could even lower your plan’s minutes and start using an app like this to communicate more often. There are a few features, though, that are premium. You cannot send messages to a group of people (i.e. 2 or more) without an in-app purchase. You also don’t have access to ringtones, emoji, and a few other extra features. The majority of user complaints are about the plain interface and sometimes slow receiving of messages, but that was only a handful of reviews. 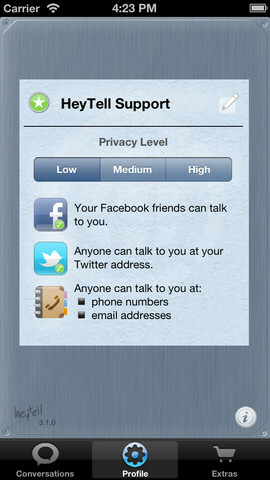 HeyTell is a useful app for sending and receiving voice messages. Whether you are looking to use your data plan rather than voice plan minutes to chat with friends or want to bring Nextel’s push-to-talk feature to your iPhone, then HeyTell will satisfy your needs. Not to mention that this app is cross platform!